Blencathra is a good looking mountian for hiking next to the A66 road that runs between Penrith and Keswick, sitting high above the village of Threlkeld. The image below is from the Threlkeld Mining Museum, looking north to the A66, Threlkeld village, and Blencathra Mountain. There are six main routes to hike Blencathra, the two steadiest routes are from the west and east, as seen left and right in the image below. The three ridges in the middle are steeper and a little dangerous. The ridge round the back on the north side is really dangerous. There are three car parks for hiking, the one on the far left is up on the mountain side with the single lane Blease Road leading up to it from the centre of Threlkeld. The car park on the top side of Threlkeld, just up round from the Horse & Farrier Inn, also on Blease Road, has a scenic woodland path out onto the mountain, from where you can choose from four routes to Blencathra summit. The car parks to the east, right in the image below, are at the White Horse Inn. One car park is a large layby across the road from the inn, one is the inn car park that should only be used if you are using the inn for drinks and snacks after the hike, and there is another car park about one third of a mile up the hill road next to the White Horse Inn. The car parks by the White Horse Inn are used for hiking up the steady east side Scales Fell, and the dangerous Sharp Edge round on the north side. Only hike Sharp Edge if you have a head for heights, and like a fair amount of danger. Sharp Edge Photos. The large image is 2963 pixels wide, so you will have to scoll sideways to view it all. The image below is of the top hiking car park on the west side of Blencathra, up past the Horse & Farrier Inn in Thelkeld, follow the signs for Blease Road and Blencathra. This park is just past the Blencathra Centre. The car park here is about 900ft above sea level, so about 1900ft to the summit. That is the trail leading from the car park that winds back to the left and up the west side. The image below is from the other car park on Blease Road, a few hundred yards up round from the Horse & Farrier Inn in Threlkeld, about 600ft above sea level. The woodland path from this car park, as seen below, is scenic with a wooden bridge across the burn. The top of the woodland path gives you a number of routes onto the mountain, or walks along the bottom of the mountian. The image below is from the top of the woodland path from the car park in Threlkeld. One trail from here leads round to the left, and up the steady and safe route to Blencathra summit from the west. The trail straight ahead leads up and to the right for the steeper Gategill Fell, with an interesting ridge at the top. The image below is from the top of the woodland path, looking east to the path along the bottom of Blencathra. This path keeps you away from Gategill Farm, that is a busy working farm. Halls Fell is just along there about half of a mile, and Doddick Fell about another half mile beyond that. Halls and Doddick have the most adventurous looking routes to the top from this side, with narrow ridges to follow close to the top. The image below is from where the trail along the bottom of Blencathra reaches Halls Fell. That is the highest point on Blencathra up there, and there is a knife edge ridge leading straigh to it from this fell. If you are going to Doddick Fell, just follow the good path along the bottom here for about another half mile. This is a really steep route, and these two men have just run down it. 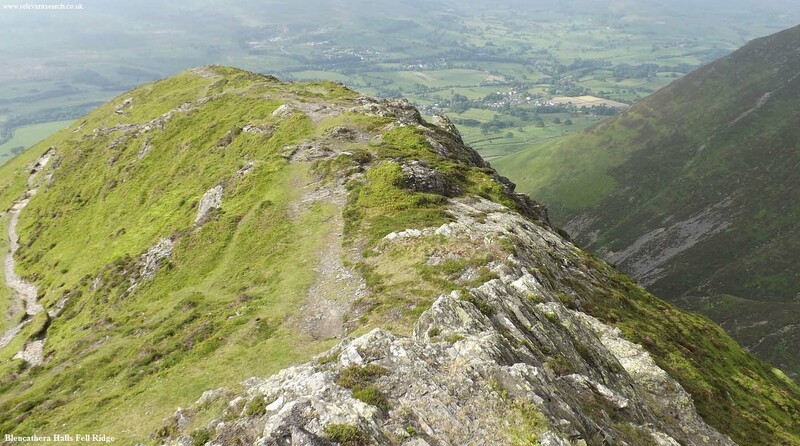 The image below is of Halls Fell Ridge, leading to the highest point on Blencathra. That is the Doddick Fell Ridge over to the right, another interesting route up. There is a trail all the way along the top of this ridge for the adventurous, and another trail most of the way just down from the top. The lower trail has a few spots where it is narrow and right over high drops, so is a little dangerous as well. I got to a rock pinnacle about 200ft from the top, in real thick cloud. You either have to climb straight over the pinnacle, or follow a faint trail down to the left and back up beyond the pinnacle. I hung around for the cloud to clear, but it looked like it could have been hours, so decided to head back down. The image below was taken on the road back down, when the cloud lifted for a couple of minutes. I met a hiker going up that stated the route to the left of the pinnacle is fairly safe, then it is just a short, steep hike from there to the summit. I mainly hike to get sunny images, so getting to the top in thick cloud is not much use to me. I will return. It was my last day, so only had three hours to get up and back down. The image below is from Halls Fell Ridge, looking west across to Getegill Ridge. Now that looks another interesting route up. The image below is looking back down Halls Fell Ridge. I was staying at Doddick Farm Holiday Cottages at the bottom of Doddick and Halls Fells, and each morning while walking the dog, I looked up at this ridge thinking, I just have to get up there one day for some photos. I thought this was Sharp Edge, but was informed by a hiker, Sharp Edge is over the the top on the north side, and is a fair bit tougher than this ridge. The image below is heading back down Halls Fell Ridge with the village of Threlkeld down below. The image below is from the bottom of Halls Fell Ridge looking down the main path. This is a fairly steep hike all the way up to this point. You can see the path leading along the bottom of the mountain, and the woodland path down to the car park. This is an interesting mountain with a number of good looking routes to the top, need to try a different one ech time I am in the area. The walk along the bottom is interesting as well. The Horse & Farriers Inn, and White Horse Inn, are ideally situated for drinks and meals, also for accommodation, I liked both.